I know, I know ... everyone thinks they have the best Dad in the world. But mine really is best. What a HAPPY family your dad is surely so proud of. HaPpY BiRtHdAy to Dad! Got to love Dads. Happy Birthday! Happiest of happy days for your fabulous Dad. 1) I love this tribute to your dad! I hope he has a wonderful birthday. 2) I love the name of your blog and more importantly what you did for your mother. What a great daughter! It is wonderful to have a dad like yours! Happy Birthday to him! 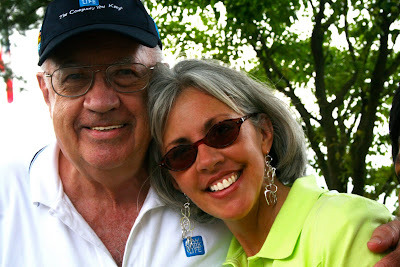 How wonderful to have your Dad to light up your life and put things into perspective! "Happy Birthday" to a special Dad who loves and is loved in return. Happy birthday to your dad! He has a great smile. Magnificent, who was happy to see you all. Congratulations. I wish you a happy weekend. He sounds wonderful! Happy Birthday! First of all thanks for stopping by, and if your Dad is the best like that then you need to share!!! ~snicker~ HAPPY BIRTHDAY DAD!!! HUGZZZZZZZZ & A Birthday smooch! My Dad use to be the best, but he's in Daddy heaven now. I miss him a lot. He was the smartest Daddy I must say. He had an answer for everything & a saying for everything. For example one I never forgot & one I say to my kids, "
When not in use to off my juice!!! LOL He was such a card. Hugzzzz to our Dads! Have a great weekend. he must really be such an awesome and amazing person for you to give him a tribute like that. I am the one lucky enough to be HIS wife! Dads are a great blessing, even after they are gone. He IS a cute dad! Happy birthday! aw, happy birthday to him! so many smiles and so much laughter...you've made my heart soar! thank you! and happy birthday to your wonderful dad too! Dads are wonderful. ps... u look great in green! Hi there....haven't visited you in awhile. It sounds like YOUR dad.....is just like MY dad. Funny, how that is with dads....and daughters who adore them. he sounds just like YOU! happy birthday to your dad, what a sweet post you wrote about him! The apple doesn’t fall far from the tree I see, Happy Birthday to your lovely Dad. Thanks for sharing your Dad with us hope you have a wonderful day my friend.